I have a new passion and that is tea. My passion used to be Dr. Pepper, but then I married Jonathan and he didn't like coke (I say, "coke" 'cause I'm from the southwest, see?) and so I gave that up for love. I tried to like coffee but it just never happened all the way and why push things? Jonathan didn't like that either anyway. Coke Zero has been a nice substitute (after 7 years of marriage with no DP there had to be an outlet somewhere!) and tea floated in and out. I knew I was supposed to like tea because I liked books. The two go hand and in hand. Alas. I felt like a failure in the beverage department. So, as I say, my friend took me to this tea house little knowing that she was going to create a TEA MONSTER. But that's exactly what she did. Here's another confession: I've never really connected with Austen. I think that's due in part to the fact that all women everywhere seem to and so I felt pressured to like her when I wasn't yet ready to. (What can you glean from my personality with that last statement?) Then, a year or so ago I re-read Emma and enjoyed it. As our family is in the planning stages for a trip to England, I've been thinking that I should read and re-read some Austen to prepare myself when Jonathan handed me Tea with Jane Austen . I read devoured this title and have begun to appreciate and love Austen because I found something in her to like and not just because I was told by society that I should (because I'm a female and Colin Firth is Mr. Darcy or something like that). You might say that Jane and I are bonding over a cup of tea. 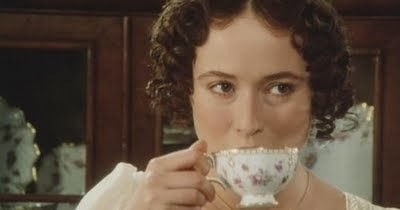 Tea with Jane Austen takes a look at Jane's relationship with this popular beverage. 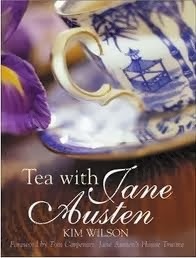 She explores a little of the history of tea, explaining why it featured so heavily in Jane's works. For instance, when tea was first presented to the public it was very expensive and only the wealthy could afford to drink it. The Austen family went to great pains to purchase their tea which they kept locked up, away from the servants. Jane herself was the one who made the family's tea and approached it very thoughtfully. Author Kim Wilson explores the social aspect of tea, how it grew in popularity, the opposition it met with and, of course, the way it was come to be taken. This is a very fascinating read not just as it relates to Jane Austen but how we, the modern reader, can relate to tea as well. There is something very relaxing about taking a cup of hot tea. For one thing, it's usually served hot so that you can't gulp it in one fell swoop. You take small sips, usually while reading a book or conversing with another. A hot pot of tea makes the world slow down somehow. Like magic. It sets one at ease in a way I've only recently begun to understand. A pretty cup in the hand delights the spirit as well as the eyes and there is encouragement in taking a moment to stop and just be. Tea has long been linked to books, of course, and I can see now how fitting that is. You want to sit and savor the words as well as the flavor on your tongue. In a world of books and tea there is no hurry and no rush and that is the very opposite of what we're used to experiencing in our lives. It is good to be busy and to be productive but it is also important to stop and rest and fellowship. I think there is something in the practice and habit of taking tea that ministers to the soul. It gives one pause. And it's pretty. Also, it is yummy. There is nothing to complain about here. If you love tea or Jane Austen (or probably both) then I think you'll find Tea with Jane Austen a quick and entertaining read. I loved it. For the curious, I read the book in two sittings. The first half of the book was accompanied by a couple of cups of pumpkin spice chocolate tea. The second reading was spent with peppermint chocolate. Well! So much to love about this post! 1. I'm STILL re-reading P & P, so it's very timely for me. 2. I've begun to enjoy tea, too, over the past couple of years. However, I have never had chocolate tea. I must remedy this! 3. I think the fact that your dh surprised you with a book from your wish list is super sweet! 4. You're planning a trip to England? Wow! Yippee! It cracks me up that you've never been an Austen fan because you rebel against anything that's expected. I also want to like tea more. In fact, your talking about it time after time has made me want to try more flavors. I DID try chai vanilla at church, and it was good. I haven't actually checked my grocery store to see if they sell chocolate tea. I think I'll add it to the list. I began drinking coffee when I was in my mid twenties. Last fall I switched to tea. I love it. The first think I do in the morning is put the kettle on the stove to heat water, then pour the hot water into a tea pot. I drink P J Tips tea, it's a bit strong so I cut back to 2 tea bags per 4 cups of water. I drink almost 1 pot of tea in the morning. I also enjoyed "Tea with Jane Austen" and specifically remember the notes about how they preserved tea when it was difficult to acquire. This edition looks newer, or at least a different cover than I remember. I'll have to look, because, well, I don't own it (yet)! I enjoy Jane Austen movies, but I haven't been as excited about reading the books. I do like tea, though I don't know if I've had a chocolate variety?! I tend to prefer herbal fruit-flavored teas--or decaf peppermint. I'm still watching Downton, but like everyone else, I was astonished and deeply troubled by the horrific incident at the beginning of this season. I'm afraid I have never learned to like tea. Hot tea, anyway. I used to drink a lot of iced tea. In some ways I wish I did because it would give me some other options for warm beverages, and it sounds so cozy. I like tea things - I think teacups and teapots are gorgeous. But I don't like hot tea itself. The smell bothers me somewhat. I don't like flavored coffee, so I don't think different flavors of tea would be appealing to me. I didn't really care for S&S or P&P when I first read them, and I was surprised, because I liked the film versions I had seen. But I have enjoyed them more on subsequent readings. Persuasion is still me favorite Austen book, though. @Barbara - AH!!! I am a sweet, iced tea drinker as well! Even on cold days I actually really do prefer a cold glass (in any of these flavors I mentioned). I try to think ahead and chill it most times...but when I'm with others I've learned to like it hot. LOVE this post! I too have rejected things simply because I was expected to like them. (Hello Kitty and the color pink, here's looking at you...) But as I've grown older, I have found there are a few things I know enjoy that I used to hate. Hello Kitty is actually rather cute when you're shopping for an 11 year old girl. ;) And I finally embraced my inner pink, though not ALL shades of pink. I have very strong preferences. lol. Tea and Jane Austen are the perfect mix! I'm glad you were finally able to give her a try and enjoy her books. I didn't read any of them until I was an adult and actually saw the movies before reading the books. The BBC versions are, of course, far superior to anything else out there. And I still need to try chocolate tea. ;) Enjoy!! I have also found a man who doesn't drink coffee or pop. I probably will never totally replace coffee for tea, but I've learned to appreciate tea a little more. I DO however LOVE Jane Austen. Of course, cause I'm a woman, a Christian, and a homeschooler...the Austen lover trifecta! The book looks very fun. I really LOVED this book also!